It happens to the best of us. You’re minding your own business and then bam–somebody adds you to a group Facebook chat for planning the office potluck, spamming your inbox with constant nofications. Here’s how to put a lid on them. If you don’t frequently use the group chat function on Facebook, it likely surprised you how fast being added to one becomes a nuisance. When there are a many (if not dozens) of people included in the group chat if each person sends only a few messages to the group a day that’s still dozens and dozens of notifications chiming on your computer or popping up on your phone. 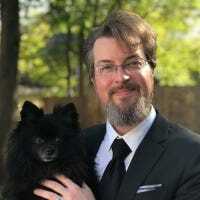 Let’s look at how you can quiet things down using both the Facebook web interface as well as the Facebook Messenger app on your mobile device. 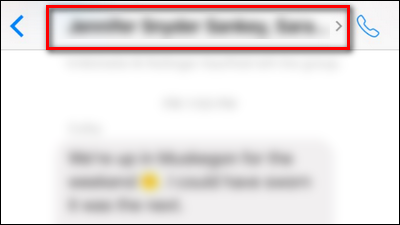 Down in the bottom right corner of your browser pane, you will now see the chat box for that conversation. Click on the gear icon in the chat box header and then select “Mute Conversation”. Here you can select how long you wish to mute the conversation. If you just want to silence the chatter about an upcoming event while you’re in a meeting, the “1 Hour” setting might suffice, until the morning “Until 8 AM”, and if you’d like to keep up with the conversation on your own time without notifications “Until you turn it back on”. Whatever choice you make here will also apply to your message notifications via Facebook Messenger on your mobile device. 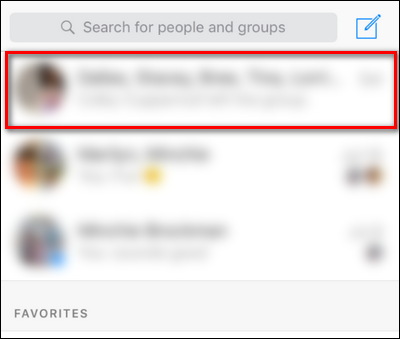 Muting a conversation in Facebook’s mobile app, Messenger, is more or less the same process (with a bit more granularity over how long the mute should last for). 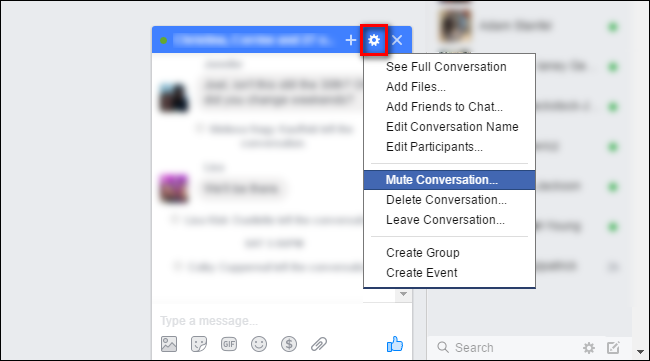 To mute a conversation in Facebook Messenger, fire up the app and select the conversation you wish to mute. After selecting the conversation, click on the title bar of the conversation (which lists off the participants like “Steve Smith, John Adams, Mark…”). 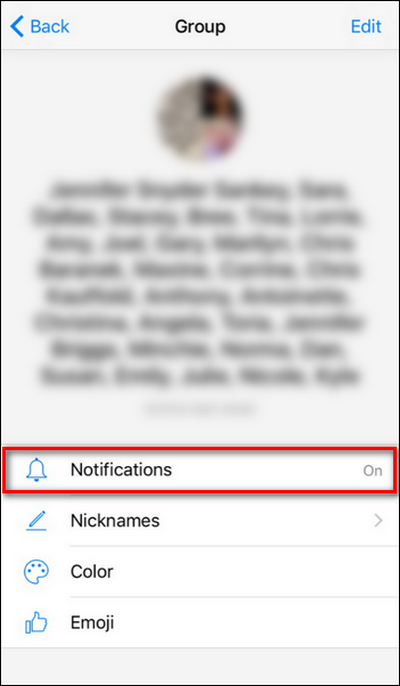 In the resulting “Group” settings menu, select the entry for “Notifications”. Here, just like on the Facebook webpage, you can select how long you’d like to mute the conversation. 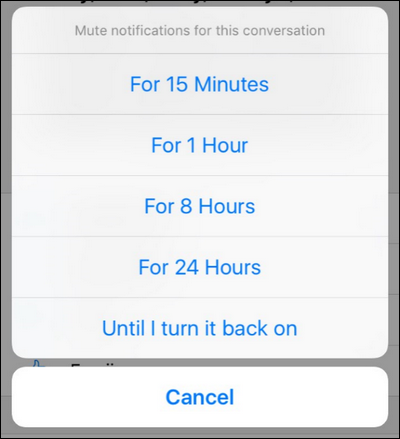 The only minor difference is that instead of 1 hour, until the morning, or indefinitely, you can mute the conversation in small increments of 15 minutes, 1 hour, 8 hours, 24 hours, or until you enable the notifications again. Tap your selection and you’re done. With just a minor tweak you can go from being very annoyed by a constant stream of notifications to helping plan Great Grandma’s surprise birthday party on your own, uninterrupted, terms.